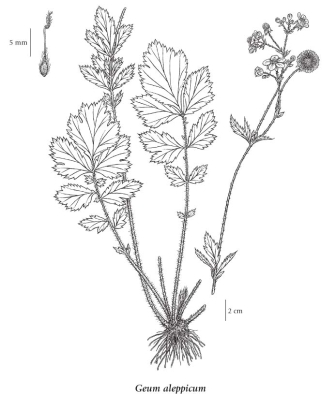 Perennial herb from a stout rhizome; stems erect, 30-100 cm tall, simple, 1 to several, tufted, coarse-hairy. Basal leaves several, long-stalked, interruptedly pinnately cleft, 10-25 (40) cm long, hairy along the veins beneath, with 5 to 9 cleft and double-toothed segments, egg-shaped with a wedge-shaped base, and a few interspersed much smaller segments, the terminal segment cleft over half its length, a bit larger than the main lateral segments; stem leaves alternate, 3 to 5, short-stalked to unstalked, smaller and with fewer segments. Inflorescence an open, bracted, terminal cluster of 3 to 10 stalked flowers; corollas yellow, wheel-shaped, the petals 5, egg-shaped, unnotched, 4-9 mm long; calyces 5-lobed, the lobes lanceolate, reflexed, nearly as long as the petals, alternating with narrowly lanceolate bractlets 1.5-3 mm long; ovaries superior; stamens numerous. Achenes, numerous, spreading, in globe-shaped heads; achenes ellipsoid, flattened, 3-5 mm long, coarse-hairy above, beaked with the 5- to 6-mm-long persistent style, which has an S-shaped kink near the tip and is hairy on the ultimately deciduous segment above the kink. Moist woods, thickets and meadows in the lowland and montane zones; frequent throughout BC east of the Coast-Cascade Mountains, rare on S Vancouver Island; circumboreal, E to NF and S to CA, NB and PA; Eurasia. The climate type for this species, as reported in the: "British Columbia plant species codes and selected attributes. Version 6 Database" (Meidinger et al. 2008), is cool temperate & cool mesothermal.